For other places with the same name, see Złotów (disambiguation). 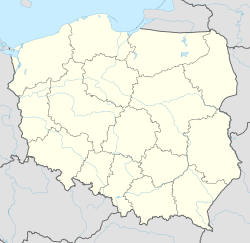 Złotów [ˈzwɔtuf] (German: Flatow) is a town in northwestern Poland, with a population of 18,303 inhabitants (2011). Today it is part of Greater Poland Voivodeship (province), previously being in Piła Voivodeship (1975–1998). Since 1999 Złotów has been the seat of Złotów County. The town is located on the river Głomia and is surrounded by five lakes. A railway line connects it to Piła and Chojnice, with buses operating locally. The local Metaplast windows fitting factory is the biggest industrial employer. The Euro Eco Meeting is organized regularly there each July. Złotów is the historical centre of the northern part of Krajna. Human activity in the region goes as far back as the 8th century BC. Around 700 AD, a hill fort on the shore of the Baba lake was the residence of a Pomeranian tribal chief. The land belonged to the dukes of Pomerelia from the house of the Samborides until the dukedom came to an end in 1294. Later, the Teutonic Knights ruled the area but the sovereignty of the territory was disputed between them and Kingdom of Poland. Złotów was mentioned in 1370 in the chronicle of Janko of Czarnkow. In 1370, Złotów was granted Magdeburg rights while under Polish rule. According to the last will of Polish king Casimir III after his death in 1370 his grandson, Casimir IV, Duke of Pomerania, was to inherit the lands of Dobrzyń, Bydgoszcz, Kruszwica, Złotów and Wałcz as fiefs. The city was destroyed in 1455 during the war with the Teutonic Knights. The town later belonged to the Potulicki family which provided it with a new Gothic castle in Renaissance style at the beginning of the 17th century. In 1619, Jan Potulicki issued a founding document for the church and parish of the Holy Assumption of Mary. Later it passed to the Grudziński family. In 1665 the town still had Magdeburg rights. The castle was destroyed during the Swedish invasion in 1657. The bombardment also destroyed other parts of the city including the city hall. A new church, still standing today, was founded there in 1664 by Andrzej Karol Grudziński. After the rule of the Grudziński family came to an end in 1688, the Działyński family came into power. From 1709 to 1711, a plague known as the Black Death affected the area. According to incomplete church records, approximately 1,650 people died as a result of the epidemic. After the first partition of Poland in 1772, Złotów was incorporated into Prussia. In 1784 a Protestant half-timbered church was built on the great market square, which during the time span 1829–31 was replaced by a modern church designed by Karl Friedrich Schinkel. The town was given county (Kreis) town status in 1818. From 1772 to 1945 as part of Prussia (later Germany) it was known as Flatow. In 1871, a railway line from Schneidemühl was completed. Around this time many local people emigrated to America, including many members of the local Polish minority. In 1919 it was decided that while most of the Kreis Flatow was ceded to the restored Polish Republic, the city of Flatow would remain inside Germany. This caused huge protests from the large Polish minority of the city (approx. 12%) and the surrounding rural lands. From 1922 until 1938 Flatow was part of the newly formed Province of Grenzmark Posen-West Prussia inside Germany. When this province was dissolved on 1 October 1938, Flatow was integrated into the Province of Pomerania. The local synagogue was destroyed during the Kristallnacht in 1938. After World War II, with the German–Polish border moved westwards to the Oder–Neisse line, Złotów and its surroundings became part of Poland. The German population was expelled. The local women's volleyball team, Sparta Złotów, plays in the third national league. ^ Johann Friedrich Goldbeck: Vollständige Topographie des Königreichs Preußen. Part II, Marienwerder 1789, pp. 99-100, no. 4). (in German). ^ a b F. W. F. Schmitt: Topographie des Flatower Kreises. In: Preußische Provinzialblätter, Andere Folge, Vol. VII, Königsberg 1855, p. 116 (in German). ^ August Eduard Preuß: Preußische Landes- und Volkskunde. Königsberg 1835, p. 377, no. 6 (in German). ^ Amtsblatt für den Regierungsbezirk Marienwerder. Vol. 43, No. 23 from 8 June 1853, p. 135 (in German). ^ E. Jacobson: Topographisch-statistisches Handbuch für den Regierungsbezirk Marienwerder, Danzig 1868, pp. 4–5, no. 36 (in German). ^ a b c d e Michael Rademacher Deutsche Verwaltungsgeschichte Pommern - Landkreis Flatow (2006) (in German). ^ Gunthard Stübs und Pommersche Forschungsgemeinschaft: Die Stadt Flatow im ehemaligen Kreis Flatow in Pommern (2011) (in German). Wikimedia Commons has media related to Złotów. This page was last edited on 13 June 2018, at 14:59 (UTC).